A film screening with a panel of Bay Area speakers, accompanied with dinner. Wine and beer will be available or sale, or you can BYOB (wine and beer only). We are eager to watch this exciting film with you all in our classroom! 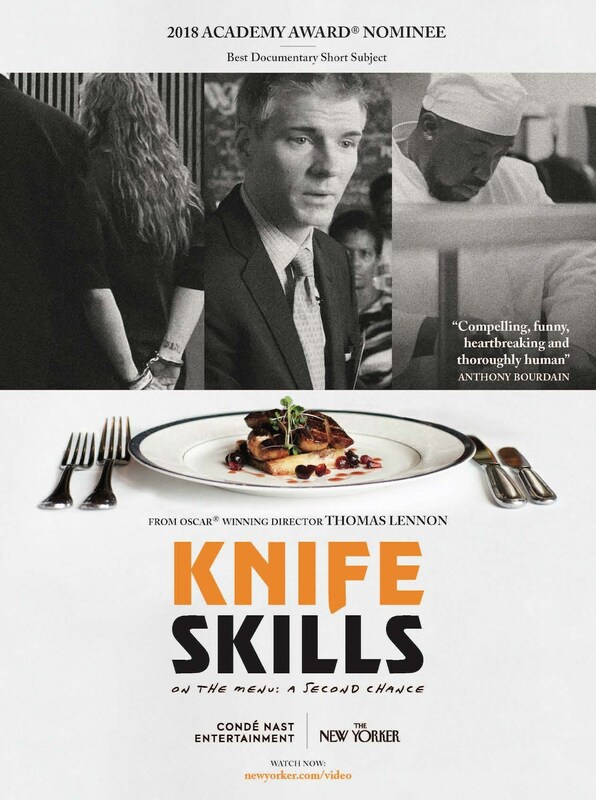 Knife Skills is an Oscar®-nominated documentary about reentry, second chances, and the healing power of good food. The short film follows the launch of Edwins restaurant in Cleveland staffed almost entirely by men and women just out of prison. Besides learning to cook and serve (new trades for many of them), the film reveals other challenges they face to lead new lives. Working with reentry populations is a mission for a few inspiring organizations and businesses here in the Bay Area. To bring this film's story closer to home, we're creating a panel of those involved in this work locally, moderated by local community leader, Jennifer Siswandi. Panelists will represent Cala Restaurant, Episcopal Community Services and the CHEFS Program, Hayes Valley Bakeworks, and Rubicon Bakery. Inspired by the title of this movie, we will be serving a meal students enjoy in our bestselling Basic Knife Skills class: our Vietnamese-inspired cabbage salad (with optional chicken and peanuts), with fried shallots and fresh herbs. Dessert will be generously provided by Rubicon Bakery: Mom's Chocolate Cake. It's a signature item, with 27 years of history at the bakery. This is an evening you won't want to miss! Jennifer Siswandi is a Food Justice Leader with the Tenderloin Healthy Corner Coalition who has a passion of improving access to healthy foods in low-income neighborhoods. She works with The Coalition to mobilize Tenderloin residents and corner store owners to take action about food issues, in a neighborhood where there is no full-access supermarket. She also spent two years working at Tenderloin Health Services, a primary care clinic where she co-facilitated a weekly diet and exercise class to the clinic's patients. As a San Francisco native, Jennifer is committed to advocating for marginalized folks who are caught up in the food system both in terms of food production, and food consumption.